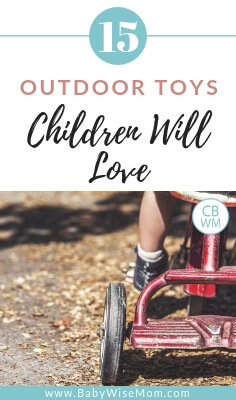 Outdoor toys children will love. Over 15 gift ideas for children. Outdoor toys for children to use their imaginations and get exercise. Toy Lawn Mower: Ours is not fancy, but very well loved. Brayden uses it each time Daddy mows the lawn. They have some pretty nice and fancy ones out there. One bad thing about our very inexpensive one (less than $5) is that it is hard for a younger child to push around. By younger I mean any child under two. They way it folds up is the problem. A younger child unable to adjust the way they push usually ends up pushing the lawn mower right over into folded position. So if you are getting one and hoping your little “toddler” can walk around the yard with it, test it first. Also keep in mind most yards are not perfectly smooth and those bumps often cause the problems. I think a sturdier lawn mower would be better for the young child. was a real help around the house. This fall when we raked leaves, he worked harder than I did at raking those leaves. Little Snow Shovel: If you live where there is snow, a little snow shovel is a fun toy for your child. Last year, Brayden used his spade shovel and ended up breaking it. This year we went to Home Depot and bought each child a small snow shovel that is height adjustable. They really do help and it is great exercise during those winter months. Sand Toys: Buckets, shovels, animal shapes you stuff with sand, etc. Complete Sand & Water Beach Play Set: Includes Toys, Watering Can, Bucket, Shovel and more! Big bouncy balls: Get a ball based on your child’s size. Even before she was one, Kaitlyn loved to hold a ball outside. It was big for her, but smaller than a basketball. This year Brayden had a blast with the really big balls that are larger than I can get my arms around. For the younger kids, I have liked those bouncy balls you see in the big, tall bins in stores. They are light in weight. We once bought a rubber bouncy ball for them to play with (like you would play kick ball or four-square with) and it was just too heavy and could hurt if they got hit with it. Sidewalk Chalk: This is a fun art activity for outside. Please share your favorite outdoor toys! We love the Power Wheels Jeep. We got ours FREE from our neighbor whose boy outgrew it. We were so excited when he offered it! Otherwise, we wouldn’t have been able to afford one. Lorri,I don’t think you are unreasonable to not want your son to chew on other toys or other kids to chew on his…but in a playgroup situation I don’t know what you can do about that. If you want him to not chew on other’s toys, you will have to train him to not chew on his own toys. The hard thing is that it is a developmental action. 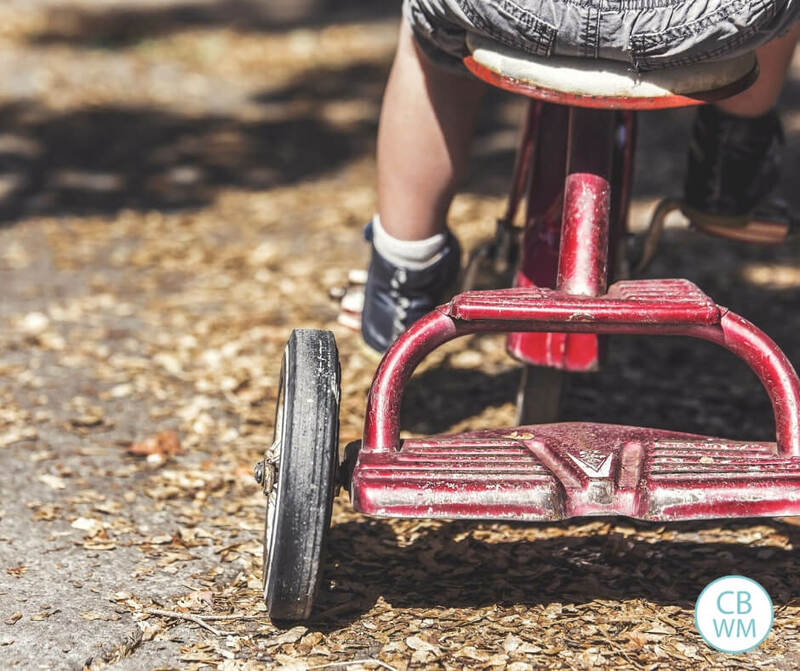 Boys typically take longer to stop putting things in their mouths than girls.When you have kids over who slobber on the toys, memorize which toys were slobbered on and clean them after the kids leave. Put up toys that would be hard to clean or you especially don’t want slobbered on.I would also talk to the moms in the group to be on the same page as to what the sickness policy is. How sick is too sick to come? In the end, getting sick helps you be immune in the future, and you can’t avoid all sickness (especially colds). So take precautions, but expect sickness to come, especially being in a playgroup.